How Does a Weather Radio Work? Tornado season in the U.S.
For emergency purposes, the device is perfectly fit. 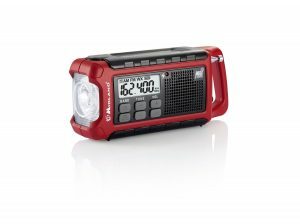 The weather radio alert and the high capacity battery offer you the best chances of getting through a crisis. You will have good reception on the weather band, and the speaker is good. While other crank radios offer you the possibility to listen to NOAA channels, this emergency radio one gives a loud signal and flashes whenever an alert is sent out. If disaster strikes, you can trust the bright flashlight and charging capabilities of this small gadget. You’ll be informed, be able to maintain phone contact and walk into dark areas. For an emergency radio with so much to offer, there seems to be an unexpected downside. You get a low replenishment rate by using the crank for the rechargeable battery. The crank is solid and easy to work with, but it needs more time to do the job. More minutes of winding up the internal alternator and more speed are required to give you the necessary power to use the radio and flashlight. However, charge time and battery life score much higher, so it balances pretty well. Click here to see what customers have to say about this product! The Midland ER210 is a compact AM/FM and NOAA weather radio. As it was designed for emergencies, the weather band receiver will not let you down. You can listen to weather forecasts, severe weather alerts or other civil emergencies. To make sure this radio is a life-saver, its designers arranged for the weather alerts to turn on automatically. A warning will be your best defense against disasters. While listening to weather channels or AM/FM broadcasts, you can always extend the telescopic antenna whenever you need a better reception. Also, the maximum volume is really loud, so you’ll have a chattering companion. This tiny item has a bright, 130 lumen Cree LED, one of the brightest you will find in emergency weather radios. That is good news when you consider the circumstances you’re preparing for by purchasing this product. But what’s even better is that there’s more than just the on-off button. You can use the high-intensity phase or the low intensity one, to save power and adjust brightness to light conditions. And there’s the Morse code distress signal. 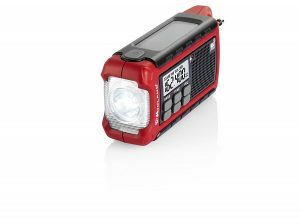 When you’re in trouble and need others to find out about it, the third phase of the Midland ER201 attached flashlight is the S.O.S. Morse signal. That’s a smart option for a radio that weighs under 11 oz. The Midland ER201 is endowed with a replaceable Li-Ion battery of 2000 mAh that can keep the device going for 25 hours of normal use. All of these details are a win: it holds its charge, it provides lots of power to external devices, and you can replace it when it dies out. It can be recharged by using its hand crank, solar panel or simply an USB cable. You can also use 6 AA batteries or rechargeable battery pack in case you need a prolonged power support. As mentioned above, you can charge external devices such as cellphones and tablets (much more than with other power banks) by connecting them to the USB output port. Here’s the great thing: you don’t need an adapter for that, one that you can lose or break. The backlit LCD display is truly useful. It shows you what station you’re listening to, what time it is (in a 12 or 24-hour format), the frequency or the channel number of the weather channel. It also shows you the battery strength, which is something you would like to know. Click here and check out the best prices for this model on Amazon.com!